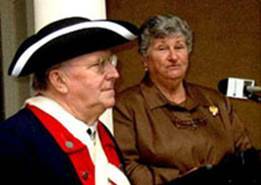 On April 11, 2003, Delaware Governor Ruth Ann Minner hosted a public ceremony to thank Edward W. Cooch and his children for arranging to sell to the state of Delaware the land and development rights for about 200 acres of land on the site of the battle of Cooch's Bridge. The land had been zoned for commmercial and industrial use and is surrounded by housing developments and a majot interstate (I-95). The land will now be preserved as woodland and glades, remaining as it was in 1777. The Cooch family also created a $1.5 milllion fund for the maintainance and renovation of the property, which includes the bridge and a grist mill. The family home (built about 1750) will remain with family, but the state has right of first refusal in any proposed sale. Delaware Governor Ruth Ann Minner and several other state officials spoke to an audience of people dedicated to history and conservation. During the ceremony Ned Cooch spoke about the battle and the history of the Cooch land. 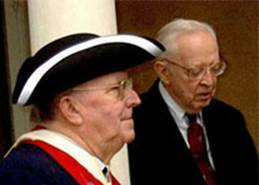 He noted that the family had also given the state 300 acres on nearby Iron Hill, the site of a Revolutionary War era iron mine and foundry and the site from which Generals Washington and Lafayette observed the British invasion force in August of 1777. HISTORY: The battle at Cooch's Bridge was a harrassing action intended to slow the establishment of the British landing perimeter around Elk Landing MD in August 1777. General Washington had formed a special corps under Brigadier General William Maxwell, comprised of 100 good marksmen from each of the six brigades, so this was the first employment of a truly national unit, rather than the usual use of men in state regiments led by officers from their own state. The action had the desired effect of showing the enemy that the invasion would meet stiff resistance -- about thirty men on each side perished in the fight. After the battle British General Cornwallis ordered the troops to burn the Cooch mill, and Cornwalis used the Cooch home as his headquarters for ten days while his troops gathered strength and local horses for the Battle of the Brandywine. These informal photos were taken at the recognition ceremony, held on 11 April 2003. THE LAND: Thomas Cooch, Sr., bought the property when he came from England in 1747. He was a colonel in the militia during the Revolution. The family has often hosted re-enactments of the battle and has been active for many years in conservation and historic preservation affairs. In 1910 the Delaware Societies of the SAR and DAR led the effort to erect at Cooch's Bridge a monument, which is surrounded by four cannon from the War of 1812, on loan to the DESSAR from the Brooklyn Navy Yard. Cooch's Bridge is a historic district located at South Old Baltimore Pike, Newark, Delaware.